Like all types of vinegar, apple cider vinegar, offers powerful antimicrobial properties that are at least as effective as store-bought products without harmful chemical ingredients. In fact, when it comes to your health as well as the health of our planet this natural disinfectant is far superior and strong enough to handle just about any germy task. 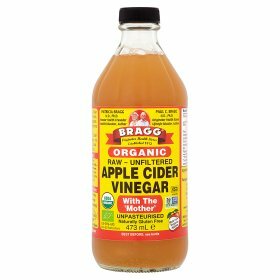 Apple cider vinegar has so many uses everyone should always have at least one bottle in the house (and if you don’t, you can get a giant bottle from here). It’s gotten a lot of press recently about its medicinal benefits, and offers a myriad of ways to use it in all sorts of recipes, but did you know that there are ways to use it to clean every room in your house? Like all types of vinegar, apple cider vinegar offers powerful antimicrobial properties that are at least as effective as store-bought products without harmful chemical ingredients- important to keep in mind with small children in the house. In fact, when it comes to your health as well as the health of our planet this this natural disinfectant is far superior and strong enough to handle just about any germy task. While it can be mixed with other natural cleaning ingredients like lemon juice, salt or essential oils, don’t mix it with baking soda as it neutralizes the acidity of the vinegar. According to Canada’s National Collaborating Centre for Environmental Health, the acid in vinegar crosses the cell membrane of bacteria and prompting a release of protons, which causes the cell to die. Once you’ve read about the many ways to utilize ACV, you may never want to use those chemical cleaning solutions again. And of course its good for home air quality.